Editorial: What is wrong with patriarchy? - The fault is not with patriarchy per se, but with our distorted understanding and implementation, notes Jacob Ninan. Billy Graham: An example for ministers of the Gospel - Duke Jeyaraj challenges fellow Christian workers to emulate the example of Billy Graham. God made women - Swathi John calls all women to stand for what they rightfully ought to be. 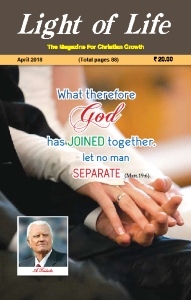 Whom God has united - God has to bind people together before they can be one—truly one, teaches Kuruvilla Chandy. Life with true love - Christians need to test and identify their right belief and right moral principles, teaches Akash Surjya. The letter to the Hebrews - The book of Hebrews remains the best antidote against all temptations to slide back, states Luke Vydhian. Laws of sowing and reaping - Stanley Mehtatakes us through the laws of sowing and reaping from the world of agriculture, but full of spiritual meaning. Five sins that Jesus hated most - Zac Poonen calls us to hate these sins thoroughly in our lives. Is your soul well-dressed? - Let us be diligent in the stewardship of our body, emphasises Samson Gandhi. Resolutions - Issac Gabriel A. challenges us not to procrastinate, but to live as examples for others. The exemplary Exemplar - How are we faring in obeying the two commandments to love? asks Suresh Manoharan. The making of Peter the disciple – 12 - We as Christians must fight against the devil’s great deceptions with all our hearts, exhorts Sandeep Poonen.